Stealth parental Skype recorder. Spying over Skype calls. Parental Skype recorder is a unique tool for stealth Skype monitoring. Once installed it starts automatically on Windows startup, shows no icon on the taskbar or system tray and secretly monitors Skype activities. All type of Skype conversations will be recordered to compact mp3 files with call details: time of call, contact name, type of Skype call. Main features: - no visible windows or icons. 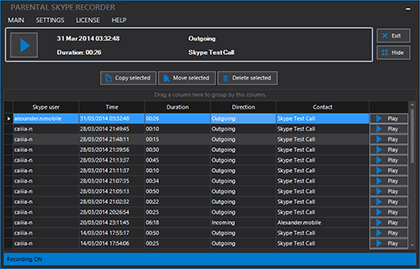 Hidden monitoring - easy to use - automatic launch on windows startup - automatic recording of any type of Skype calls, including conferences - customizable hotkey combination for showing hidden Skype recorder window - records are stored in compact MP3 format, using high quality Lame MP3 encoder - records are placed in hidden folder Recorder window is hidden. To check the records it could be shown using customizable hotkey. This could be protected by password. Parental Skype Recorder End user license agreement This is a legal agreement between you, the "END USER", and Domit Ltd ("DEVELOPER"). Use of this software (the "SOFTWARE") created by DEVELOPER indicates your acceptance of these terms. 1. GRANT OF LICENSE. The software is licensed, not sold.